Objective: Previous studies on bone mineral density (BMD) abnormalities associated with hypothyroidism are scarce and not conclusive. The effect of thyroid hormone therapy on BMD has shown mixed results. The aim of the present study was to determine the severities of osteoporosis in female patients with hypothyroidism in comparison to healthy women. Methods: This cross-sectional descriptive study was performed on 150 women aged over 50 years. Totally, 100 patients with primary hypothyroidism and 50 healthy subjects were enrolled in this study and divided into three groups. Group A, which consisted the patients who had been recently diagnosed with primary hypothyroidism. The second group of patients diagnosed with primary hypothyroidism for at least 2 years and was treated with levothyroxine (Group B). The third group of healthy individuals was selected as a control group (Group C). Blood samples were taken for the measurements of thyroid stimulating hormone (TSH), and bone densitometry was performed to determine the BMD reported as T-score in order to measure the severity of osteoporosis. T-score of the lumbar vertebra (L2-L4) and femoral neck were measured with dual energy X-ray absorptiometry and were compared between the three groups. Data were analyzed by SPSS using regression analysis and Mann-Whitney, Kruskal-Wallis, or analysis of variances statistical tests. The statistical significance was set at a P < 0.05. Findings: The average age of patients and baseline serum TSH levels in Group B was significantly different from the other two groups (P < 0.001). T-score of the lumbar spine (L2-L4) in Group B was significantly lower than the other groups (P = 0.01). The linear regression between serum TSH levels and BMD categories were not clearly associated. However, after removing the effect of the baseline TSH level in Group B, bone loss was significantly greater than the other two groups (P = 0.01). Conclusion: According to the present study, it seems that the treatment of hypothyroidism with thyroid hormones reduces both serum levels of TSH and bone density. Hence, proper control of this risk factor can be an effective way in prevention of osteoporosis. Likewise, euthyroid women with serum TSH levels in the lowest tertile of the normal range have a higher incidence of vertebral fractures, independent of thyroid hormone levels. However, studies have shown that TSH has a negative regulatory effect on bone turnover. However, TSH in hypothyroid patients is still unclear whether increasing or decreasing, or whether it is effective in causing bone loss. In patients with congenital hypothyroidism, bone growth has been shown to be slow or halted. , Furthermore, initial treatment with thyroid hormone improves growth and BMD in children. 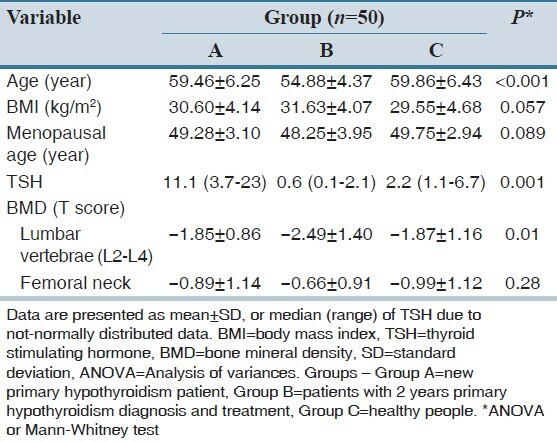 , In three studies in patients with thyroidectomy, TSH was inhibited by levothyroxine hormone therapy and no reduction in the rate of BMD was observed. ,, Previous studies on BMD abnormalities associated with hypothyroidism are scarce and not conclusive. The effect of thyroid hormone therapy on BMD has shown mixed results. ,,,,,,,,,, In one study it was shown that the risk of bone fractures were increased in patients with a high TSH; and patients with a suppressed TSH, when compared to patients with a TSH in the laboratory reference range; so patients with a high or suppressed TSH had an increased risk of fractures, but patients with a low, but unsuppressed TSH did not. In patients with untreated hypothyroidism, the mean thickness of the cortical bone was reduced and following treatment increases. ,, Given the importance of bone loss in hypothyroid patients and knowing its relationship with TSH levels, this study was conducted to evaluate the relationship between osteoporosis and osteopenia with primary hypothyroidism in women. This cross-sectional study was conducted in Isfahan, Iran, from February 2010 to December 2013. The study population included over-50 years' old hypothyroid and healthy women, who had referred to the rheumatology and endocrinology clinic of the Alzahra hospital for the diagnosis and treatment of osteoporosis. A total of 150 women aged over 50 years were assigned to one of three study groups: Group A consisted 50 patients who had been recently diagnosed with primary hypothyroidism. The second groups of 50 patients diagnosed with primary hypothyroidism for at least 2 years and were treated with levothyroxine (Group B). The third group of 50 healthy individuals was selected as a control group (Group C); these people were selected from the women with the same age who had not any symptoms of hypothyroidism, and their serum TSH was in the normal range. Hypothyroidism was defined as FreeT 4 < 8 Picomol/L and TSH higher than 10 μIU/ml. Having a normal calcium, phosphorus, albumin, Vitamin D and alkaline phosphatase were the other necessary criteria for being included in the study. The cases were dropped out of the study if they had a history of alcohol abuse, asthma, cancer, liver failure, renal failure, hyperparathyroidism, hypercalcemia, glucocorticoid consumption, prosthetic fracture at L2-L4 vertebrae and femur, cardiac disease, chronic gastric problems (malabsorption, chronic diarrhea and crohn's disease), treatment with calcium or vitamin D supplementary, anticonvulsants, heparin, lithium, cyclosporine, bisphosphonates, calcitonin or replacement hormones, ovariectomy, rheumatoid arthritis or other rheumatic-inflammatory diseases, smoking and lack of patient cooperation. The bone density based on the T-score of femoral neck and lumbar vertebrae were compared between three groups. For densitometry, dual-energy X-ray absorptiometry was used to measure the bone density in lumbar vertebrae (L2-L4, anterior-posterior measurements) and femoral neck. The measurement was performed by an expert technician using the Explorer™-Hologic's bone densitometer manufactured in USA (Hologic QDR 2000). Patients with hypothyroid symptoms and somehow similarity in terms of height and weight who were willing to participate in the study were selected. A 10 ml of blood were taken and sent to the laboratory on ice within 30 min. Serum was kept at a temperature of −20°C for further testing. TSH was measured through ELFA (electro Luminofleurecent assay) technique. TSH normal range was considered as 0.5-5.5 μIU/ml according to detecting kit data. If the TSH was above 10, FreeT 4 level of the serum were measured considering the normal range of 9-20 Picomol/L. If FreeT 4 was <8 Picomol/L and TSH was higher than 10 μIU/ml, then primary hypothyroidism was confirmed, and the patient was a candidate for treatment with levothyroxine. Before the treatment, subjects underwent bone densitometry. Finally, a complete set of data was collected for each patient. These include: Patient's age, history of hypothyroidism or other chronic diseases, weight, height, body mass index (BMI), T-score data of lumbar, and femoral neck densitometry, calcium, phosphorus, alkaline phosphatase, Vitamin D and TSH levels and duration of hypothyroidism. The Ethics Committee of the Isfahan University of Medical Sciences approved this study, and written informed consent was obtained from all study participants. 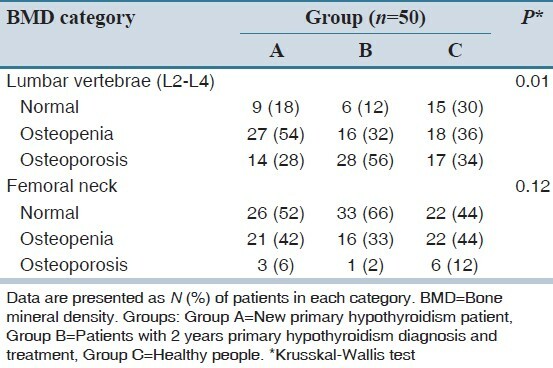 Data of 150 individuals was analyzed by SPSS version 13 (SPSS, Inc., Chicago, IL, USA) using the regression analysis (for assessing any probable correlation between hypothyroidism and bone loss), analysis of variances (ANOVA) (ANOVA, for comparing the means of data between three study groups), Krusskal-Wallis (for comparing differences between the study groups regarding the category of BMD data) and Mann-Whitney (for non-parametric quantitative data) tests. P < 0.05 was considered statistically significant. Demographic characteristics and related clinical variables of the study population are depicted in [Table 1]. As noted, there were no statistically significant differences of BMI, femoral neck T-score and menopausal age between the three groups. The mean age in Group B was lower than the other groups (P < 0.001); however, Mann-Whitney test showed no significant difference between Groups A and C with this regard (P = 0.94). Baseline serum TSH levels were significantly different among three groups (P < 0.001). Serum TSH in Group A was higher than the other groups; while serum TSH in Group B was lower than Group C (P < 0.001). This study showed that the femoral neck T-score was not significantly different between the three groups; however, the T-score at lumbar spine L2-L4 regions were significantly different (P = 0.01). Prevalence of osteoporosis was 56% in Group B that was higher than other groups. ANOVA test showed that the mean T-score at lumbar spine L2-L4 region between Groups B and C (P = 0.027) and between Groups A and B (P = 0.034) were significantly different. Mean serum TSH levels and mean T-score at lumbar spine L2-L4 region in Group B was lower than the other two groups. Regression analysis (data not shown) has not shown any correlation between serum TSH levels and T-score at femoral neck and lumbar spine (P > 0.05); however, after removing the effect of the baseline TSH level in Group B, a significant difference in the prevalence of osteoporosis at the lumbar spine were found between groups (P = 0.01). BMD categories of three study groups are summarized in [Table 2]. Krusskal-Wallis test showed significant differences in bone density of the lumbar spine among the study groups. Osteoporosis is a major cause of disability in human, while it is actually treatable. Thyroid disorders are one of the major common disorders which may affect the bone density. It has been shown that hyperthyroidism is a major cause of secondary osteoporosis. , Initial studies showed that after 1 year treatment of hyperthyroidism, significant improvement in osteoporotic patients has been occurred. , However, hypothyroidism and its association with osteoporosis is questionable since a few studies have been conducted for this subject. The purpose of this study was to investigate this relationship. In our study, in untreated hypothyroid patients (Group A), osteoporosis was not frequently evident. However, in those who received treatment and had significantly reduced TSH, the incidence of osteoporosis was higher than others. Linear regression test showed that there was no significant association in the rate of osteoporosis between groups, which may indicate a weak role of TSH. Pedro j. et al. observed a high prevalence of bone loss in patients treated with thyroxin. Vestergaard and Mosekilde studied 11,776 patients with hyperthyroidism and 4473 patients with hypothyroidism in terms of bone fracture. In hyperthyroid patients, the fracture risk was significantly increased only at the time of diagnosis, but after the diagnosis and treatment, fracture risk was reduced. Surgical treatment of hyperthyroidism reduces the risk of bone fractures, but fracture risk in hypothyroid patients both before and after diagnosis was significantly increased. They concluded that the risk of bone fractures in both hyperthyroidism and hypothyroidism are high. It seems that in adult patients with hypothyroidism, bone density increases but bone quality is poor, thus this may cause increased fracture risk in these patients. The present study also showed that at the time of diagnosis of hypothyroidism, BMD was not significantly different from normal subjects. Interestingly, the patients that received 2 years of levothyroxine replacement therapy had lower bone density. Thus, simultaneous treatment of hypothyroidism and bone loss seems to be necessary. Grimnes et al. reported that femoral neck bone density in postmenopausal women with elevated TSH levels was 5.97% higher than in women with normal TSH. The present study shows that high TSH levels in hypothyroid patients does not significantly effect on BMD of spine and pelvic. However, it has been shown in children with congenital hypothyroidism that bone density is lower than normal children. In children with subclinical hypothyroidism, bone qualities by using of quantitative ultrasound were studied. The results showed that with increasing concentrations of TSH, calculated osteo sono-assessment index is reduced. This study showed that the hypothyroidism affects the bone structure. The role of thyroid on hormone homeostasis and BMD is important. Hence, in case of osteoporosis, a thyroid disorder should be thought as a cause of secondary osteoporosis. , The present study showed that hypothyroid patients that were treated with thyroid hormone for more than 2 years had no improvement in bone density despite normal TSH, while their bone density in the spine was significantly lower than healthy subjects or patients with a new diagnosis of hypothyroidism. According to the present study, it seems that the treatment of hypothyroidism with thyroid hormones reduces serum levels of TSH and bone density. Hence, proper control of this risk factor can be an effective way in prevention of osteoporosis. All authors had active contribution in all stages of this study. 1. Ross DS. Bone disease with hyperthyroidism and thyroid hormone therapy. In Muldr JE (Ed), Upto Date. 2014; Available from http://www.Uptodate.com/home/index.html. 2. Parle JV, Franklyn JA, Cross KW, Jones SR and Sheppard MC et al. Thyroxine prescription in the community: Serum thyroid stimulating hormone level assays as an indicator of undertreatment or overtreatment. British Journal of General Practice, 1993; 43:107-9. 3. Bauer DC, Ettinger B, Nevitt, MC and Stone KL. Risk for fracture in women with low serum levels of thyroid-stimulating hormone. Annals of International Medicine, 2001;134: 561-8. 4. Klee GG and Hay ID. Sensitive thyrotropin assays: Analytic and clinical performance criteria. Mayo Clinical Proceedings 1988;63:1123-32. 5. Harvey. Molecular mechanisms of thyroid hormone effects on bone growth and function. Molecular CB, O′Shea PJ, Scott AJ, Robson H, Siebler T, Shalet SM., Samarut J, Chassande O and Williams GR and Genetic Metabolism 2002; 75:17-30. 6. Bassett JH and Williams GR. The molecular actions of thyroid hormone in bone. Trends in Endocrinology and Metabolism 2003;14:356-64. 7. Ng KW, Romas E, Donnan L and Findlay DM, et al. Bone biology. Baillieres Clinical Endocrinology and Metabolism 1997; 11:1-22. 8. Anonymous. Consensus development conference: Prophylaxis and treatment of osteoporosis. American Journal of Medicine 1991; 90:107-10. 9. Eriksen EF, Mosekilde L and Melsen F. et al. Trabecular bone remodeling and bone balance in hyperthyroidism. Bone 1985; 6:421-28. 10. Mosekilde L, Eriksen EF and Charles P. Effects of thyroid hormones on bone and mineral metabolism. Endocrinology and Metabolism Clinics in North America 1990;19:35-63. 11. Martini G, Gennari L, De Paola V, Pilli T, Salvadori S, Merlotti D, et al. The effects of recombinant TSH on bone turnover markers and serum osteoprotegerin and RANKL levels. Thyroid 2008;18:455-60. 13. Abe E, Marians RC, Yu W, Wu XB, Ando T, Li Y, et al. TSH is a negative regulator of skeletal remodeling. Cell 2003;115:151-62. 14. Newland CJ, Swift PG and Lamont AC. Congenital hypothyroidism-correlation between radiographic appearances of the knee epiphyses and biochemical data. Postgraduate Medical Journal 1991;67:553-6. 15. Chiesa A, Gruneiro DP, Keselman A, Heinrich JJ and Bergada C, et al. Growth follow-up in 100 children with congenital hypothyroidism before and during treatment. Journal of Pediatric Endocrinology 1994;7:211-7. 16. Kooh SW, Brnjac L, Ehrlich RM, Qureshi R, Krishnan S. Bone mass in children with congenital hypothyroidism treated with thyroxine since birth. Journal of Pediatrics Endocrinology and Metabolism 1996;9:59-62. 17. Leger J, Ruiz JC, Guibourdenche J, Kindermans C, Garabedian M, Czernichow P, et al. Bone mineral density and metabolism in children with congenital hypothyroidism after prolonged 1-thyroxine therapy. Acta Paediatrica 1997;86:704-10. 18. Franklyn JA, Maisonneuve P, Sheppard MC, Betteridge J, Boyle P. Mortality after the treatment of hyperthyroidism with radioactive iodine. New England Journal of Medicine 1998; 338:712-18. 19. Gorres G, Kaim A, Otte A, Gotze M, Muller-Brand J. Bone mineral density in patients receiving suppressive doses of thyroxine for differentiated thyroid carcinoma. European Journal of Nucleic Medicine 1996;23:690-2. 20. Marcocci C, Golia F, Vignali E, Pinchera A. Skeletal integrity in men chronically treated with suppressive doses of 1-thyroxine. Journal of Bone Mineral Research 1997;12:72-7. 21. Ribot C, Tremollieres F, Pouilles JM. Louvet JP. Bone mineral density and thyroid hormone therapy. Clinical Endocrinology 1990;33:143-53. 22. Schneider DL, Barrett-Connor EL, Morton DJ. Thyroid hormone use and bone mineral density in elderly men. Archives of International Medicine 1995;155:2005-2007. 23. Coindre JM, David JP, Riviere L, Goussot JF, Roger P, De Mascarel A, Meunier PJ. Bone loss in hypothyroidism with hormone replacement. A histomorphometric study. Archives of International Medicine 1986;146:48-53. 24. Amashukeli M, Giorgadze E, Tsagareli M, Nozadze N, Jeiranashvili N. The impact of thyroid diseases on bone metabolism and fracture risk. Amashukeli M, Giorgadze E, Georgian Med News 2010;(184-185):34-9. 25. Kulak CA, Dempster DW. Bone histomorphometry: A concise review for endocrinologists and clinicians. Arq Bras Endocrinol Metabol 2010; 54:87-98. 26. Flynn RW, Bonellie SR, Jung RT, MacDonald TM, Morris AD, Leese GP et al. Serum thyroid-stimulating hormone concentration and morbidity from cardiovascular disease and fractures in patients on long-term thyroxine therapy. J Clin Endocrinol Metab 2010;95:186-93. 27. Williams GR. Actions of thyroid hormones in bone. Endokrynol Pol. 2009; 60:380-8. 28. Ch′ng CL, Jones MK, Kingham JG, et al. Celiac disease and autoimmune thyroid disease. Clin Med Res 2007;5:184-92. 30. Zamrazil V. Subclinical thyroid diseases. Vnitr Lek 2007;53 (7-8):795-8. 31. Vestergaard P, Mosekilde LThyroid, et al. Fractures in patients with hyperthyroidism and hypothyroidism: A nationwide follow-up study in 16,249 patients 2002;12:411-9. 32. Biondi, B, Cooper, DS. The clinical significance of subclinical thyroid dysfunction. Endocr Rev 2008;29:76. 33. Gennari L, Bilezikian JP. Osteoporosis in men. Endocrinol Metab Clin North Am 2007 36:399-419. 34. Tsai KS, Lai SM, Huang KM, Chieng PU, Su CT, Chen FW. Decreased bone mineral density in patients with prolonged thyrotoxicosis before and after treatment. J Formos Med Assoc 1991;90:250-5. 35. Bayley TA, Harrison JE, McMeill KG, Mernagh JR. Effect of thyrotoxicosis and its treatment on bone mineral and muscle mass. J Clin Endocrinol Metab 1980;50:916-22. 36. Dhanwal D, Gupta N. Bone mineral density trends in Indian patients with hyperthyroidism after medical therapy. J Assoc Physicians India 2011;59:561-2, 567. 37. Tárraga López PJ, López CF, de Mora FN, Montes JA, Albero JS, Mañez AN, Casas AG. Osteoporosis in patients with subclinical hypothyroidism treated with thyroid hormone. Clin Cases Miner Bone Metab 2011; 8:44-8. 38. Grimnes G, Emaus N, Joakimsen RM, Figenschau Y, Jorde R. The relationship between serum TSH and bone mineral density in men and postmenopausal women: The Tromsø study. Thyroid 2008; 18:1147-55. 39. Demartini Ade A, Kulak CA, Borba VC, Cat MN, Dondoni RS, Sandrini R, et al. Bone mineral density of children and adolescents with congenital hypothyroidism. Arq Bras Endocrinol Metabol 2007; 51:1084-92. 40. Nagata M, Suzuki A, Sekiguchi S, Ono Y, Nishiwaki-Yasuda K, Itoi T, et al. Subclinical hypothyroidism is related to lower heel QUS in postmenopausal women. Endocr J 2007; 54:625-30. 42. Dhanwal DK, Cooper C, Dennison EM. Geographic variation in osteoporotic hip fracture incidence: The growing importance of Asian influences in coming decades. J Osteoporos 2010; 757102.